Yeah, that’s going to work just fine for these counts-as Arc Rifles I bashed up. I think I want to add something on the top of the packs just to balance them a bit more, but I’m happy with the result so far. Overcharged pistols for extra range? Yeah, I think they communicate that and Rule of Cool makes up for any deficiencies. Back to painting in the near future, but before that I need to get productive! Time to make some more ideas real. I better get used to the rhythmic sounds of Servitor Solus, because it’s going to be running night-and-day in the near future. Aww [expletive deleted] that! Here, time has no meaning! I have traveled all the roads! Glory to the Dark Pantheon undivided! 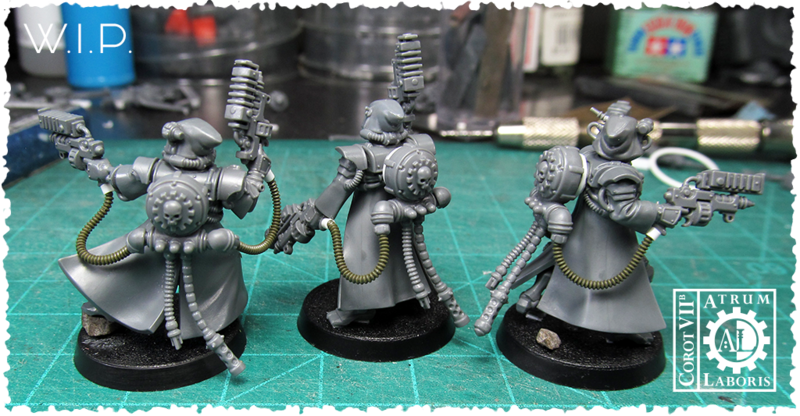 The re-re-re-building of a Black Legion Warband; and this time, I mean it! ∙ A rare visage of the Warmaster will oversee this project. However, I think it is time to move him to a cooler colour pallet. Red is so last millennium, darling… and, no capes! I’m usually not attracted to limited edition products but as a long time Black Legion collector when Abaddon cracked Cadia I couldn’t help but pick up a copy of this signed print to commemorate the event; admittedly, it’s not my favourite rendition of Abaddon but those are the whims of the Warp and at least it can’t become obsolete like a limited edition rulebook. It was actually part of an Adeptus Mechanicus bundle which was an odd combination but I was collecting kits for my Adeptus Mechanicus project that I took up as a break from Chaos, biding my time waiting for GW to give up the goods of this current release, so it was a good fit for me at the time with an eye to future plans. With the new Warmaster heralding a significant update to the core Chaos line, now is the time to revive my true muse and first passion, and soon, stop repressing the whispers from the Warp with binaric cants… or perhaps, the cants have been corrupted and subverting me all along. As GW keeps opening a Dark door ever wider it compels me to enter and consider the possibilities of a proper Chaos Space Marines and Dark Mechanicus project made real, and I think yes, it is time. ∙ I’m also not usually a sucker for themed dice, but again, the lure of Chaos was too great for me with the Black Legion dice. 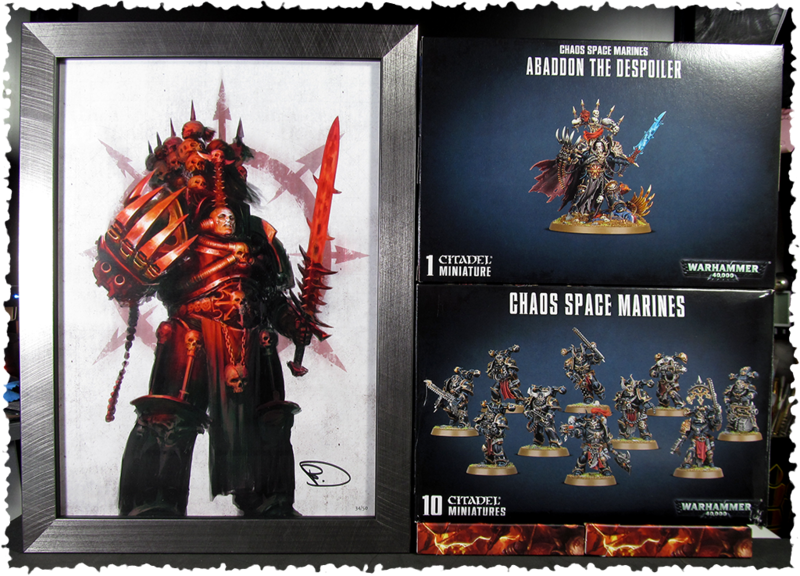 But first, as another plug for our sponsors and hobby addiction enablers, a brief review. Despite ordering some, I was skeptical and little worried that the gold might be dull and flat. I’m glad to discover that they are a nice proper rich gold colour and it has a nice swirling pearl-like lustre that has some depth. They’re even quite readable at a glance with the pips, points, skulls, and Horus Eye. Good job on these GW. I’ll also be taking a set and painting groups of five with different coloured faces for doing combined rolls, because hey, why not? So, with my Mechanicus project rather close to being complete I’ll still be putting the bulk of my hobby time towards getting that finished so I’ve got a table ready army on deck for when I want to actually throw some dice. However, the acquisition of the required personnel, wargear, and supplies has commenced, is ongoing, and I am eagerly awaiting my next dispatch. The only problem is, there’s too much choice! I can’t, for the life of me, settle on a well-rounded list to make as a core army, so I think for now I’m kinda’ liking this ‘pressure list’ that I came up with. If I drop the Decimator I can swap out the Chaos Lord for Abaddon without changing anything else, so the Warmaster is also a consideration in this list; I wish it could include an Apostle but I don’t want to drop the Warpsmith and/or shave wargear and/or bodies. Still not sure what Warlord Trait/s I’m going to take and if I want to add another relic. Double Battalions gives plenty of CP but it starts to add up when you want to take all the toys. As always, comments, questions, general banter and ideas/input for list composition are always welcome. I didn’t even focus on Chaos during 7th edition so it’s been a while since I’ve been thinking about Chaos builds and the game is so different in 8th edition that it’s a bit daunting to get my bearings again. All things Chaos, Mechanicus, and Dark places in-between to arrive in the coming weeks, months, and years, from my personal hobby-bench and from the studio workbench so keep the comm-link active. The road less travelled by ends in fiery purgation! ∙ Within the vast armouries of the Warmaster the endless mundane wargear of the Legions must also be maintained with cut, grind, blow, weld, rivet, bolt, and screw; the Warsmith directs the primitive energies of fire, force, friction, and motive force, to the sacred task of administering the many rites of maintenance, placation, and repair in service to the Warmaster’s grand arsenal. One of many small-but-crucial cogs in the great war engine that is the Legion. I have yet to build any of the other models in the Chaos Marine kit and some Havocs and Terminators just arrived today, so I’m still just taking stock of the kits. 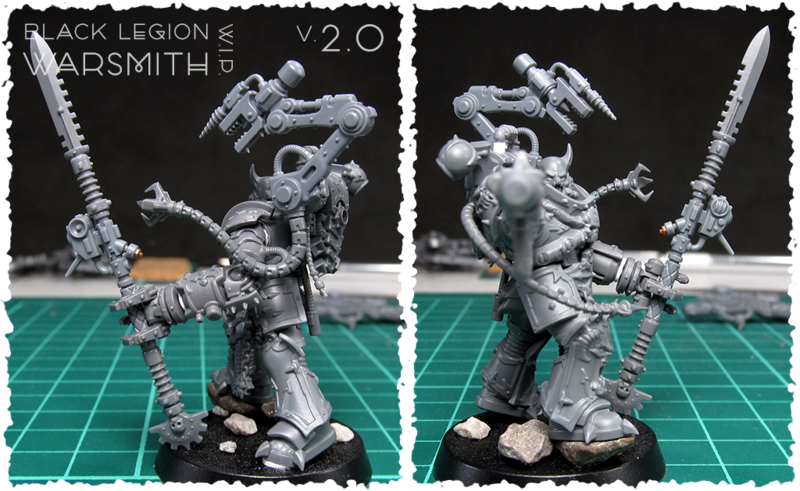 That said, I couldn’t help myself, and I dabbled away a little and came up with this personal take on a Warpsmith. I’ve never been a big fan of the ‘cloak of cables’ look that GW has been giving the Warpsmith models so I’m taking cues from the new Lord Discordant who as a better concept of what I’d prefer a Warpsmith to look like. I do still want to add a few more dangling cables and maybe another Mechatendril but nothing as over-the-top as the GW model/s. 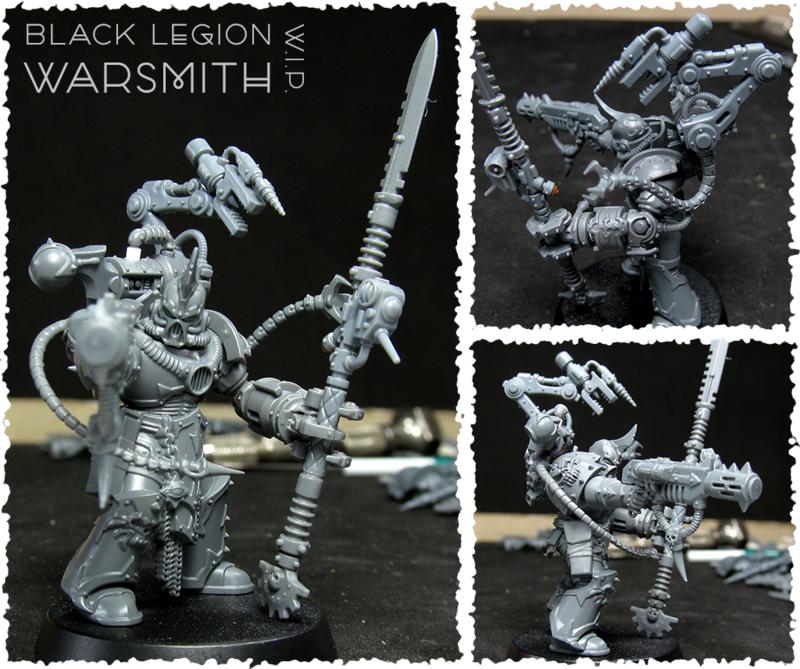 ∙ I started the first Warsmith before the new Havocs were in my grubby hands. Once I saw the models an upgrade was in order. … I am not a fan of the… unique… solution that GW chose for the wrist connections. The little key tabs, while a little useful in some of the by-the-book assemblies, really seem like an unnecessary complexity that will need to be dealt with all the time during the very common kit-bash of swapping weapons between arms. It’s the K.I.S.S. principle of design; Keep It Simple, Stupid. 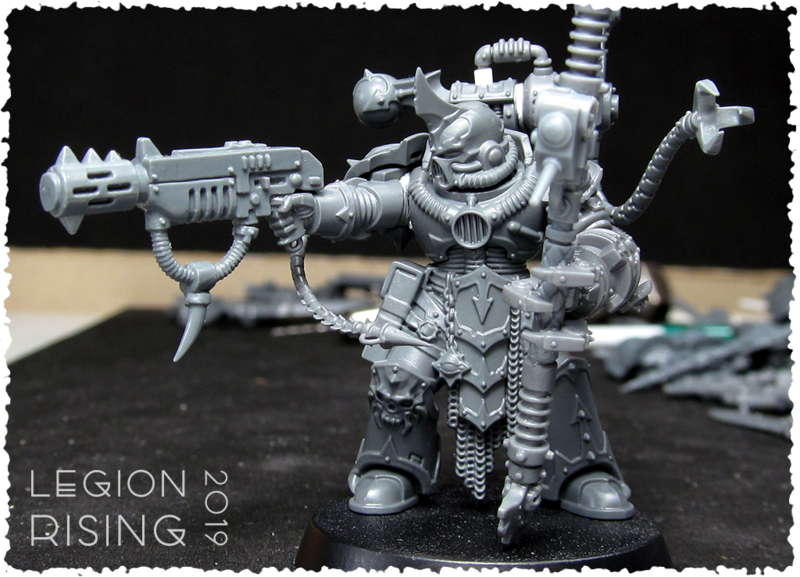 Beyond this minor quibble and a few other small things (oh look, GW’s up to the bits selection shenanigans, again) there’s a lot to like about the new Chaos kits and it’s going to be fun to see just what concoctions can be mixed up. 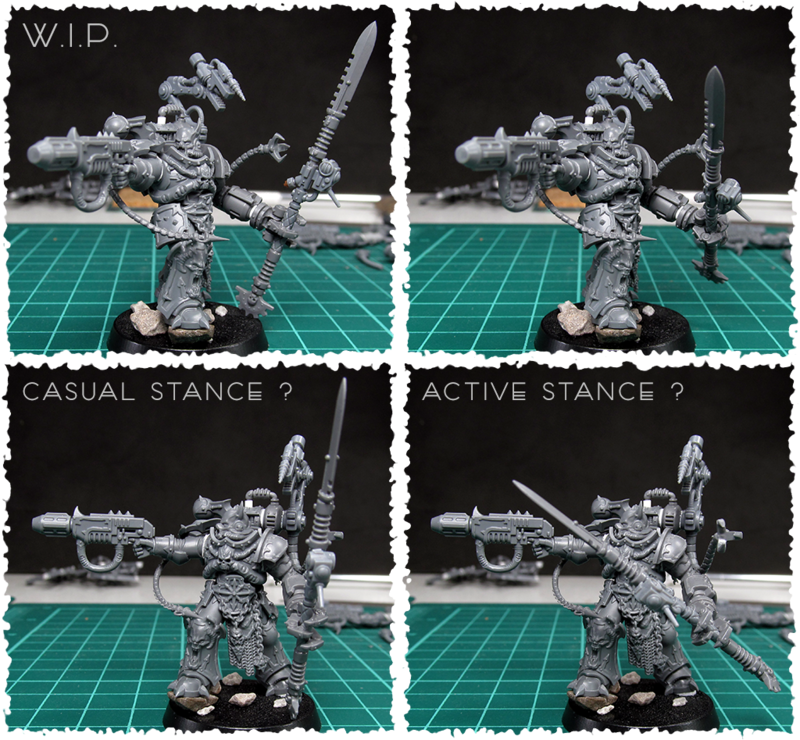 I like the details in some of the other Havoc models a bit more for a Warsmith build but this one has the pose that best suited the outstretched ‘one-handed Meltagun shot’ bash I had come up with initially and I wanted to keep that. I guess this just means that I need to make another Warsmith (or two) using one of my preferred models. Being the lowest cost Chaos H.Q., I don’t see this as a problem. The entire kit is gorgeous and the extra bulk of the models does a good job of conveying a larger-than-average Character model that would have more Wounds than a rank-and-file Troop. Why not find an excuse (or many) to use the models outside of Havoc squads? ∙ I’ve still got freedom in the left arm and I’m having a hard time picking the stance I want the weapon in. I like them both for different reasons. It’s a little thing, but it’s always this point where a bash is reaching the final tweaks that can be the most trying and somehow the most rewarding. I like the more casual pose that’s more static and has a, ‘*Sigh* Now I’m going to shoot you’ feel to it, but with the weapon in a more ready posture it gives a ‘First, I’m going to shoot you with this, then…” I’m in the same boat with the head, which I switched to being bare with the small horn; I like it, but I’m worried it’s looking a bit small/sunken in the armour – maybe a thin shim to raise it a tiny bit? But a full helmet deals with it much more readily. Ah well, a few more tweaks and perhaps another gubbins or two and this little diversion will be ready for some primer. I still wish the wastes were ‘ball joints’ or at least if the torsos could be swapped without it being a major chore, even if there was limited flexibility in the range-of-motion. But with ten wonderful unique models to use as a base bashing and converting up lots of variety in a collection won’t be that hard. I know I’m not the only one who was drawn to Chaos for the opportunity to kit-bash and convert models so I’m not intimidated and more encouraged by the quality of the ever-expanding selection of bits-and-pieces to choose from to create with going forward. Damn, this gunna’ geet guuuud! Keep the comm-link active.